In this tutorial, we’ll be creating an app that allows users to create a product on eBay through the use of the API. 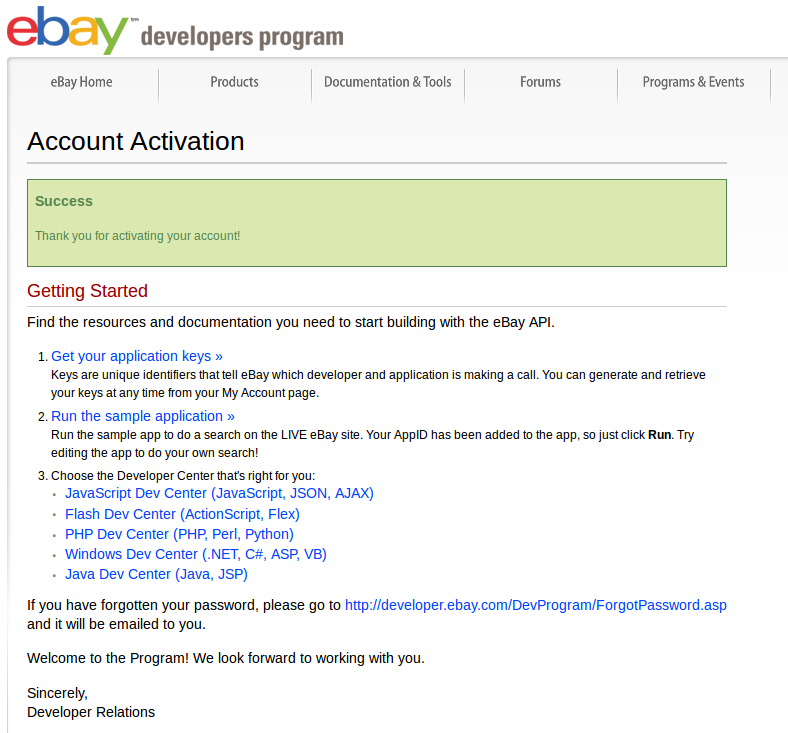 The first thing that you’ll need to do is register a developer account over at the eBay developer website. 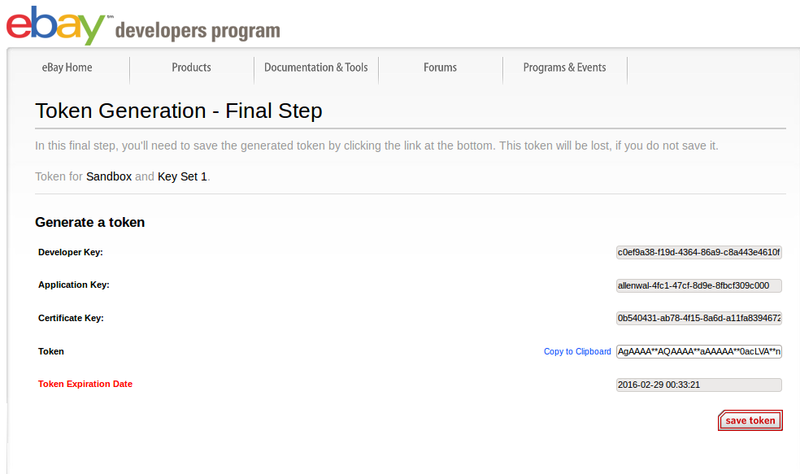 On that page, click on the ‘Get your application keys’ link, which will lead you to the page where you can generate sandbox and production keys. Then, click the ‘Generate Sandbox Keys’ button to generate the keys that you can use for testing the app that we will be building. Also click on the ‘Generate Production Keys’ button to generate the keys that you can use when you deploy the app. Note that these keys can be used with any of the APIs that eBay provides so you’ll only have to do this once. Once the keys are generated, click on the ‘configure settings’ link on any of the keys (sandbox or production). token return method – the token return method is the method that will be used by the app after the user gives authority to your app. For this, the value supplied should be ‘FetchToken’. authorization type – the type of action that your app does after the user gives authority to your app. This can be either authorization or ID.verification. Supply a value of ‘authorization’ for this field because we need the user to give authority to our app to perform different actions for them. application type – the type of the app. This should be ‘web based’. accept redirect URL – the URL to which the user is redirected when they give authority to the app. Note that eBay only allows https URLs. If you want to follow along later on, I recommend you sign up for an account at openshift.com. The apps that you host there will have https by default, and it’s free. reject redirect URL the URL to which the user is redirected when they reject the app. EBay’s developer dashboard offers a variety of tools for us to play around with. Lets take a look at the Sandbox User Registration tool. After registering a sandbox account, go to sandbox.ebay.com to test out logging in. Once you have verified that it’s working, go back to your eBay developer account page. Select an Environment – this allows you to switch between sandbox and production environments. Often times when you’re just testing from the API Test Tool you would want to use ‘sandbox’ for this. The main difference between the two is that sandbox can only be used with sandbox/testing eBay accounts, and production can only be used with actual eBay accounts. Select a key set – this allows you to change the keys that will be used for making the API calls. Most of the time you wouldn’t really have to touch this because as you select the type of environment the keys already change. 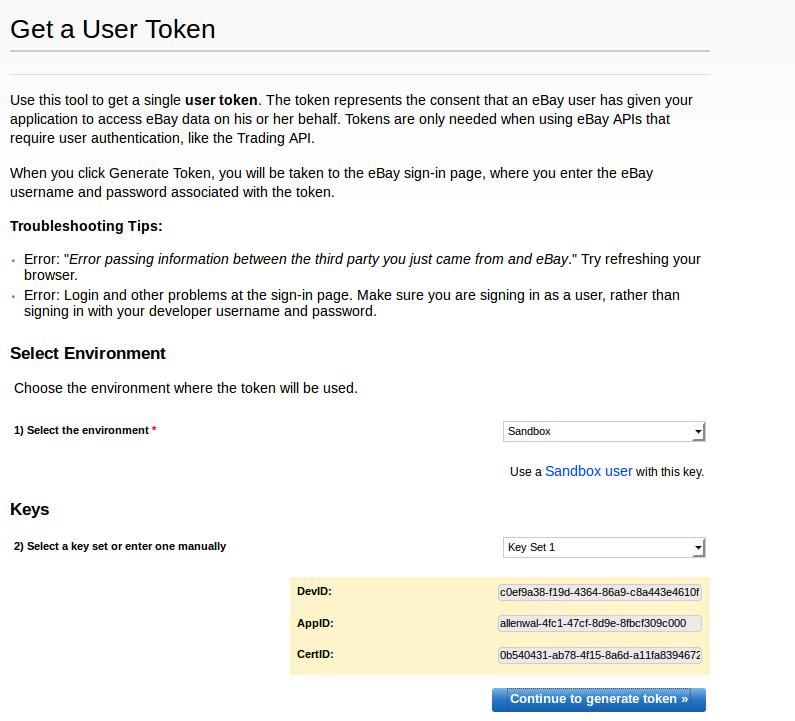 All you have to do on this page is copy the generated token then click on the ‘save token’ button. Once that’s done, you can go back to the API Test Tool page and paste in the user token that you have just copied into the user token field. Select an API Call – the actual resource in the API that you want to request. There’s a bunch of calls that you can make. You can select anything that piques your interest. Select a Template – this can either have a value of ‘full, generic’ or ‘partial, pre-filled’. Selecting ‘full, generic’ will give you blank fields in your XML Request box while selecting ‘partial, pre-filled’ will give you some basic example fields that have already been populated. Since we’re just getting started, using ‘partial, pre-filled’ is the best choice, because that would already supply for us some of the fields required by the resource that we have selected. For example, if we select ‘GetItem’ for the API Call field, this would already supply a sample ItemID and WarningLevel for us, and all we have to do is to click on the ‘submit’ button below the XML request textarea in order to initiate the request. Once you feel comfortable with using the API you can just directly add the values to the XML request textarea to modify the actual data that’s being submitted to the API. Select a Call Variation – each resource in the API can have different variations, but most of the time you would only want to make a Basic Call so you don’t really have to modify the default value for this field. Select Call Request Version – the eBay API has gone through a lot of changes, and that means there’s different versions of the API still floating around in order to support older systems. Since we’re just starting to make use of the API, we can just choose the latest version, which as of this time is version 885. Select Site ID – as you might already know there are different eBay websites. This field represents the actual eBay website where you want to make the call. Since we’re just testing using the API test tool we can just supply United States for this. Web Service URI – the URL to which all requests are made. You don’t have to modify this field. X-EBAY-API-SITEID – the id of the eBay website to which you want to make the request. Here’s a list of Site ID’s which you can use. You would want to find the Site Name and then note that corresponding eBay Site ID. X-EBAY-API-CALL-NAME – the resource or method in the API that you would want to call. Here’s a reference to the calls that you can make with the trading API. This is the wrapper for our request. It uses the GetItem request method. Note that GetItem is the name of the method in the API but we have to append Request to it. The xmlns is used to specify the namespace which the call belongs to. Most of the time the value for this would be urn:ebay:apis:eBLBaseComponents. And when I say most of the time it means most of the methods in the Trading API use this specific namespace. Next is the ID of item in ebay. The item id is the set of numbers which comes right after the title of the item. The requester credentials wrapper should contain the user token. We’ve already seen how to acquire a user token earlier for a sandbox account. Acquiring a user token for the app would basically be the same but we would have to handle saving the token in a database so that we could make use of it at a later time. Next is the Warning Level. This can have a value of either High or Low. This should always be set to High to tell eBay to return warnings for unrecognized, deprecated elements or invalid values. This would allow you to check the response if something has gone wrong with the request. Call Response – the actual response returned by the API. There’s no need to modify this as it is simply used for displaying the response. The last tool we’re going to walk through is the API Call Use Report. This allows you to generate reports of your API usage for a specific time range. This is a nice tool to have if you’re deploying an app later on, as this would allow you to determine if you are exceeding the API call limits for the specific API that you’re using for your app. In that case, you can just submit an application to eBay to increase your API limit. settings – stores the general app settings like the user token and app id. store_settings – stores the eBay store settings to be used when creating products. products – stores product details. condition_types – stores the item condition IDs and their corresponding name. listing_types – stores the listing codes. listing_durations – store the listing duration codes. For the condition types, listing types, and listing durations, we can just insert the default data directly. Also execute the following queries to do so. In this part, we prepared our environment and set everything up for a smooth development workflow in parts 2 and 3. Stay tuned for the followup in which we’ll start building our application’s logic!